Do you struggle when it comes to hanging party balloons or quickly creating great looking displays? 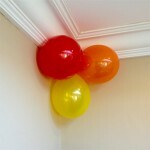 What about hanging up party balloons from ceilings or in the corners of a room? Hello, my name is David Manning and I’m the inventor of ‘Balloon Hangers’. Like most of us I found the job of hanging party balloons fiddly, time consuming and very frustrating. 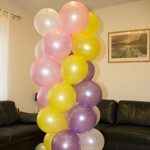 But it was whilst hanging balloons for my own children, office parties and events; I found a solution to the problem. No more cotton, string, wire or tape! So I have developed a simple tool for doing the job in seconds; making our lives easier for everyone – these are my balloon hangers. I think you will agree they are quick and easy to use, giving you more time to prepare for your special occasion or simply let your hair down and enjoy the party! 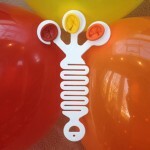 Balloon Hangers provide the perfect look for your balloons for almost any occasion you can think of. Gone are the days of holding them together with string and tape! Taking just seconds to set up, it is guaranteed to make your life that little bit easier and hassle free! The first thing to do is to blow up your balloons and knot them, then attach each one in turn to the device and you are ready to hang using a drawing pin or mounting putty … it’s really that simple!